It’s been a long six and half years since our long range live aboard expedition to the remote outer atolls of the Seychelles came to an abrupt halt on the 28th of March 2009 due to the sudden increase in piracy. 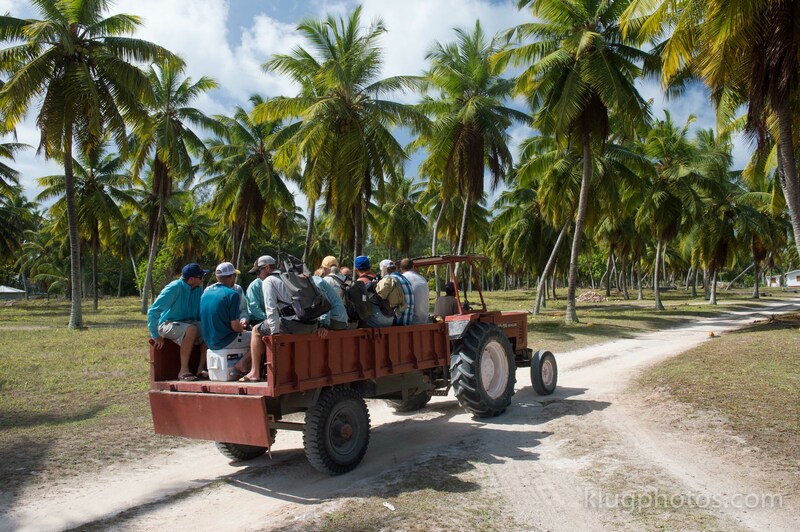 Over the years the old guide team shared many stories, reminiscing about the “old days” and wondering if we will ever get to get back to Providence, everyone felt they had unfinished business on this atoll in particular. Once the decision to go back was set in stone, we reached out to some of the members of the old guide team and they immediately jumped onboard. As abruptly as the fishery was yanked away from under us it was suddenly back. Nine months later, Tim Babich and I were joined by veteran Providence guides Paul Boyers and Warren Deysel on the MY-Dugong in Mahe. We were to spend the next three days sailing down to Farquhar Atoll where we would collect the remaining expedition members. 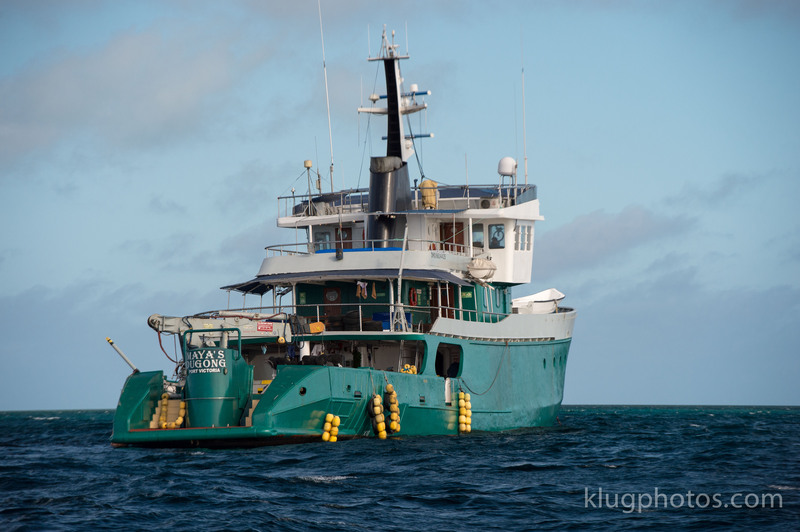 The anticipation of being back was overwhelming and we spent the time onboard enjoying endless discussions about how much it’s changed and whether our old haunts would still produce fish. Along for the ride and to document our return was the crew from Confluence Films (the same guys who filmed Waypoints, http://www.confluencefilms.com/) and Tom Bie, editor of The Drake Mag (http://www.drakemag.com). Some pressure was there for sure, but we were confident we would find what we were looking for. When we reached Farquhar we were joined by Farquhar head guide Mathieu Cousson and a group of guest from our friends at Yellow Dog Flyfishing Adventures in Bozeman, Montana. Everyone boarded the MY Dugong and we had lunch before setting up tackle on the back deck in preparation for the first days fishing. After supper the captain lifted the anchor and we started sailing to Providence 6 hours away. I didn’t sleep well the first night, the anticipation of what we were going to find the first day made me restless. I was up at first light and after several cups of coffee and huge breakfast it was finally time to gather our gear and boot-up! Part of the Confluence Films/Yellow Dog team was Camille Egdorf, a young lady angler who grew up on a fishing camp in Alaska. Camille would fish with Tim Babich and myself for the week, so when it was time the three of us grabbed our rods, jumped on the tender boat and headed out to the flats with nerves jangling. We fished the northern tip of Providence North Island first and slowly made our way down the western side of the island on the high tide. We encountered several Bluefin Trevally and a few small GT’s, no fireworks but it was good to be back on Providence again. 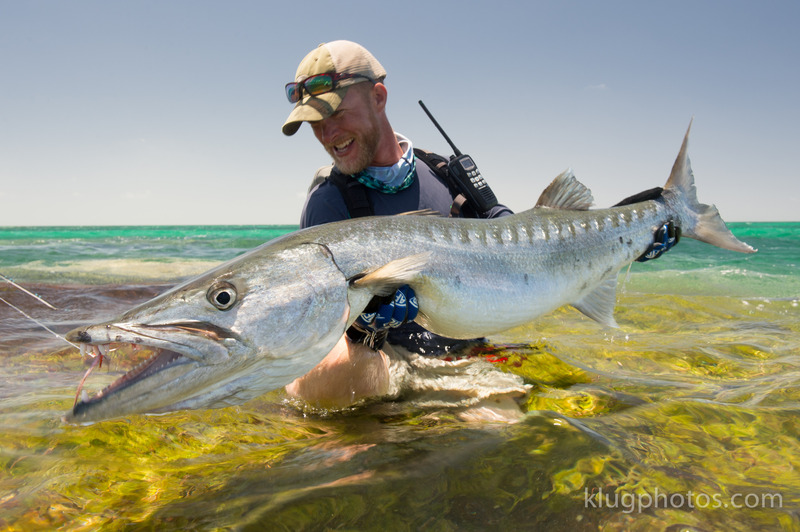 As the day progressed the tides became more favourable and shortly after lunch we encountered some memorable GT’s. If memory serves me right both Tim and Camille caught nice GT’s that afternoon. 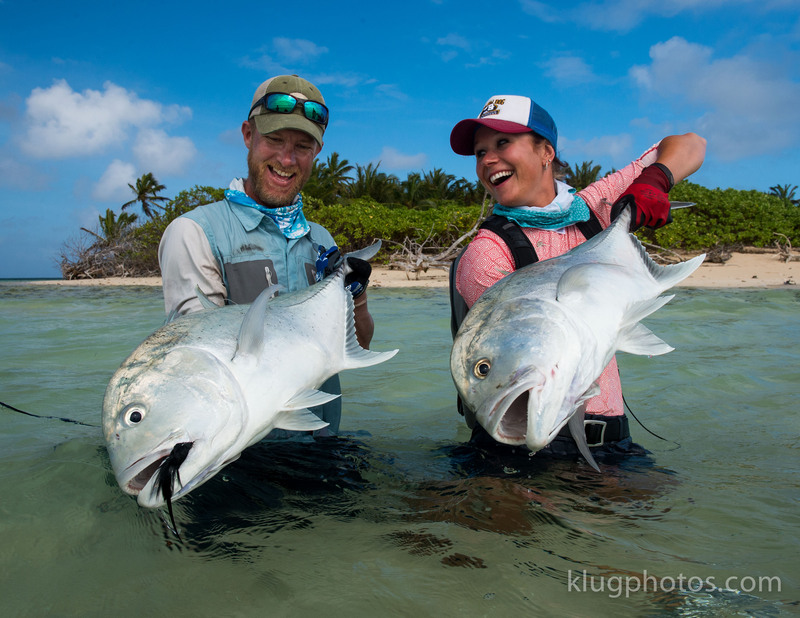 Tim spent some time with Camille explaining the finer aspects of GT fishing to her & where to look for them. She is an accomplished angler in her own right and we only needed to explain something to her once. Within a couple of days she was as accomplished and comfortable on the Indian Ocean flats as any angler I have ever been privileged enough to fish with. She simply turned into a fish slaying machine catching almost everything she cast at! Towards the end of the afternoon I waded onto one of the finger flats that run into the northern most lagoon on the atoll. 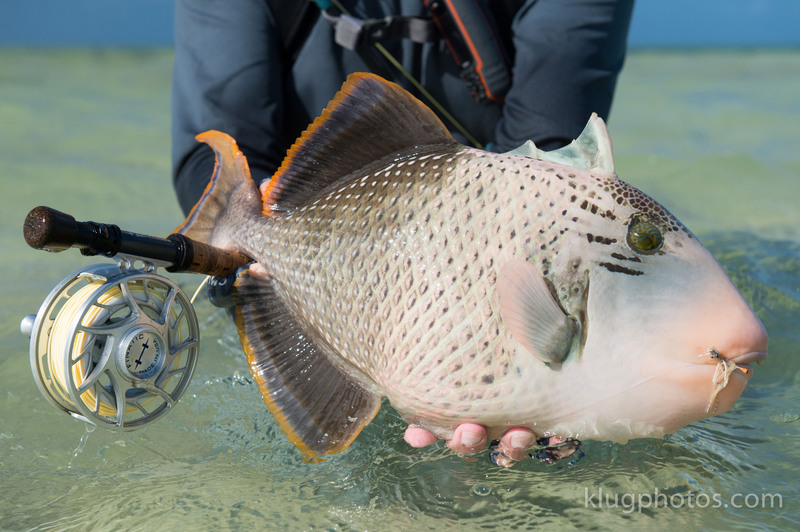 Conditions were perfect for Triggerfish and suddenly tails started popping up all around me. I literally walked from one Yellow Margin Triggerfish to the next, hooking 7 and landing 4 in quick succession. I had a handful of shrimp flies on me (a new pattern that I tied on the way down to the atoll) when I started but by the end of it I had zero left. Some were bitten off but mostly the hooks were destroyed like only a Triggerfish can, turning top quality saltwater J-hooks into what can best be described as an “off-centre circle hook” in the blink of an eye. When we returned to the boat it seemed that all the anglers had enjoyed a great first day, many memorable Bonefish were landed including one by Scott Harkin, which pushed the 10lb mark. 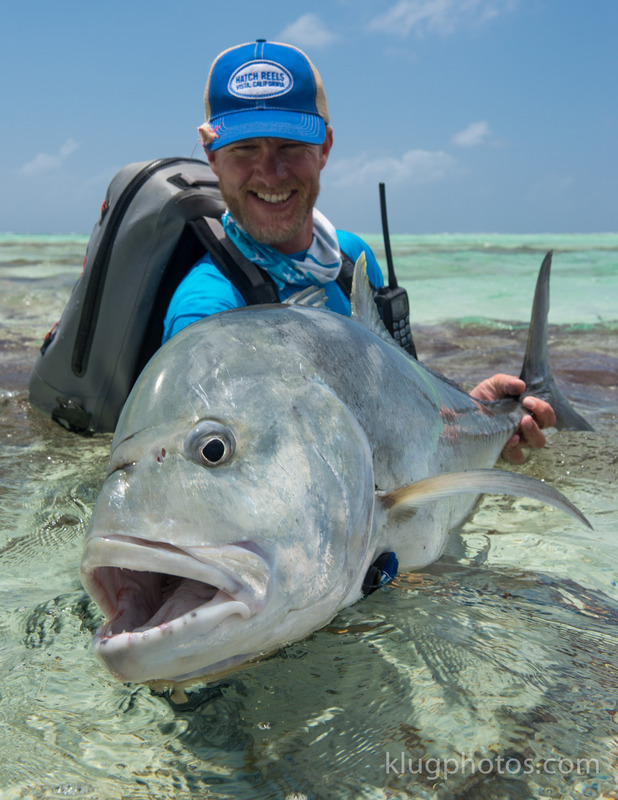 Another notable was the Indo Pacific Permit landed by Gary. It was one of his first fish on Providence and another reminder why this atoll has haunted us over the past 6 years! That first day seemed to set the trend, for the rest of the week, we experienced Providence as good as it’s ever been. Everyone got stuck into the GT’s, with one group of anglers landing 16 fish in a single session. The biggest GT of the week came to Kevin on the last afternoon. Saving the best for last he managed to land a superb 121cm GT on what turned out to be his last cast on Providence. The fish was almost lost to a shark that guide Paul Boyers managed to fend of. It was a textbook ending to a superb week of fishing! We had caught numerous GT’s, Triggerfish, various Snapper and Grouper species, Dogtooth Tuna, a monster Barracuda and many more. 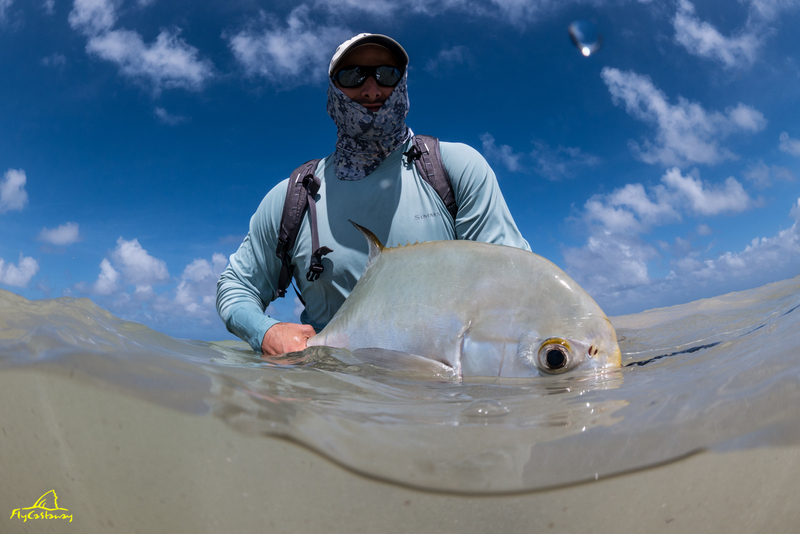 Needless to say it was great to be back and we now look forward to sharing this atoll with the angling public for years to come! A big thanks to Kay, Bobby, Scott, Neville, Kevin, Rick, Tom, Ralph and Gary for joining us on the this momentous and unforgettable journey, we hope to see and fish with all of you again soon! Gerhard , I still talk about my last trip to Providence just before the fishery closed , unfortunately my old school friend who lived in RSA passed away and my excuse for being close at hand in order to hop across to Seychelles has gone . I still have ambitions to fish with you Guys again, maybe late 2016 , and am delighted to read your opening account , please keep us informed and excited !!! good to hear from you Derek, ill drop you a mail! we look forward to having you there Gerry!